In a pan over medium-low heat, melt butter until entire pan is coated. 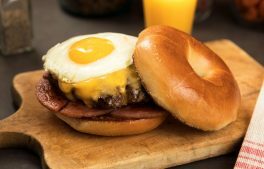 In a pan over high heat, fry pork roll (or bacon) is desired crispiness. Set aside. While pork roll (or bacon) is cooking, in a medium bowl crack and scramble eggs with a fork until no white is visible. Pour eggs into pan and scramble until fluffy-about two minutes, or until desired doneness. Before eggs are cooked through, separate in pan into four equal portions. Place a slice of American cheese on each portion. 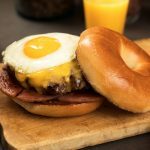 Build your Burgers: Bagel Bottom Half, Pork Roll, Burger, Eggs with Cheese, Ketchup, Salt & Pepper, and Bagel Top Half.